Achieving Service-Oriented Architecture helps to set up an SOA Architecture Practice defining the policies, procedures, and standards that apply not just to IT developers but to the entire corporation as it relates to business applications. 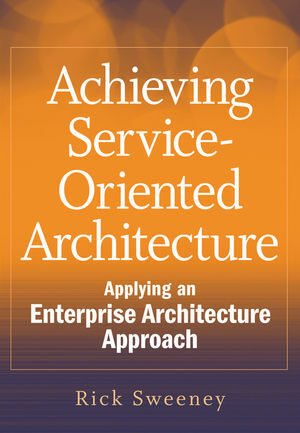 Defining how an Architecture Practice can transform itself and your corporation to maximize the benefits of the SOA approach, Achieving Service-Oriented Architecture provides a pragmatic enterprise architecture approach and framework for implementing and managing service oriented architecture from a business organization and business practices perspective. RICK SWEENEY is an independent consultant who specializes in enterprise architecture and SOA practices. Prior to starting his firm, he was the chief architect for sixteen years at Blue Cross/Blue Shield of Massachusetts. While there, he developed an architectural framework and methodology that laid the foundation for an SOA to support a multitude of health industry partnerships and information-sharing initiatives. In addition, he worked for Wang Laboratories, where he implemented fifteen major systems in nine months to support the creation and operations of Wang's wholly owned captive finance subsidiary, Wang Credit Corporation. Visit the author's blog at www.soaistheway.wordpress.com.